Half past seven on a Sunday. Freya's down. I have just finished bathing Moomin because she decided to roll in cow dung today. It is not the most comfortable experience leaning over the bath when you are nine months pregnant! Craig's cooking a fish stew and I am just putting off doing the ironing. It's actually been very good having the threat of labour and strange midwives poking around the house- it has meant that everything has to be kept tidy- probably for the first time in my life, I used to save it all up for a day off and do 6 hours worth of cleaning at once. It's not been a particularly productive weekend but we did manage to get some stuff done. Craig has play barked the garden- it's finally looking tidier for the winter, which is definitely on the way. We have had a couple of mornings with ground frost and the heating is now on- a sure sign. Freya has had an outing to the soft play centre and a walk on the moors (without me!). Craig has also sold some gubbins on eBay. Mum and dad's breakfast table, which mum has been dying to replace for ages, has made them £25- better than a poke in the eye. We have also sold some crockery which we haven't used and is probably never going to get used. The money from the crockery is going to go towards the double buggy. 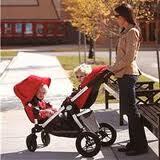 It is a lovely buggy, the kids can face each other and it comes with a carrycot attachment for the wee one. Unfortunately, it is £600, so we have really had to 'copper-up' for it. However, seeing as how we go out for a walk everyday- it should be worth it. Time for a small glass of wine in front of QI with my hubby and beautiful smelling pooch.